I write to share an announcement for an exciting lecture next Thursday, April 19 at 7:30. 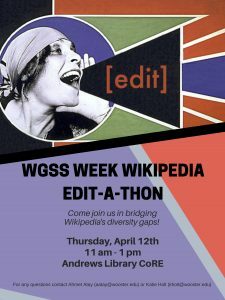 Come join us for the WGSS Week Wikipedia Edit-A-Thon this Thursday, April 12th from 11am to 1pm in the Andrews Library CoRE. I write to share an announcement from Dr. Jeff Lantis, Chair of Global and International studies. Thanks again to Megan for a very productive workshop! Here is the link for the EdTech iMovie Tutorial. Keep taking your Instagram photos! Check out the rich schedule of events for International Education Week! Events start this Friday night, November 3rd at 7:30 in McGaw Chapel with the Culture Show. Great topic that definitely deserves better coverage! I think this is an interesting idea – a great way to provide better information about the history of US immigration policy. What specific interventions/ improvements do you have in mind?